Many years ago, a budding teenage me was snooping about the dusty corners of that wonderful den of geekery, “Another World”, when I should chance to happen upon a book. Something about it caught my eye, and a quick flick through hooked me in completely. I stumped up my £10 (or whatever it was) and off I went with a book that would bring me many, many happy hours of nerd bliss. Now, I’d seen a few AA “Levy” series minis in blister packs and bought a few to use as 40k Imperial Guard renegades/ Chaos cultists/ Genestealer cultists/ PDF, because they caught a pretty cool aesthetic with the visored helmets, flak armour and Space-Kalashnikov rifles, and the Crusader series had appealed to me as Space Marine proxies,so curiosity got the better of me and I thought what the hell. 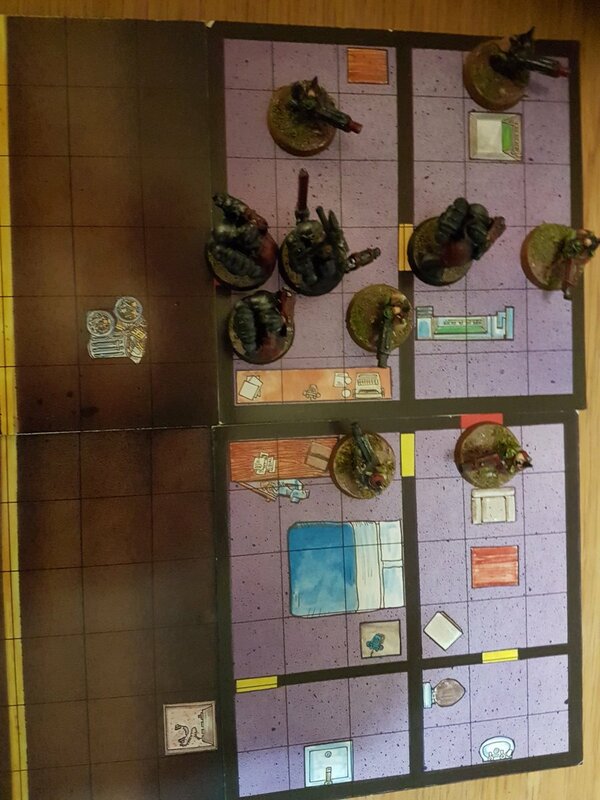 The game included some thin cardboard terrain tiles and tokens, a long way from GW quality cardstock, a few typos in the rules suggesting poor editing… I didn’t expect much. Boy, was I ever wrong. 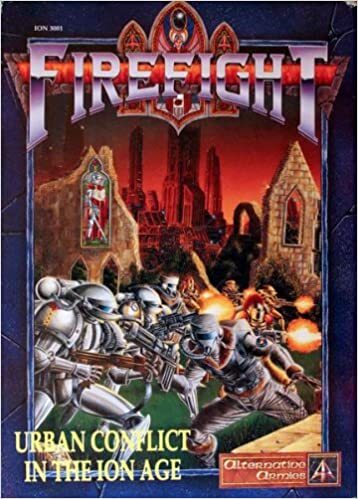 Firefight is a brilliantly designed game, based around the concept of action dice allowing you to do particular things (I’m willing to bet more than a few of the Mantic design team played this game back in the 90s) – close fought, addictive, fast and deadly. 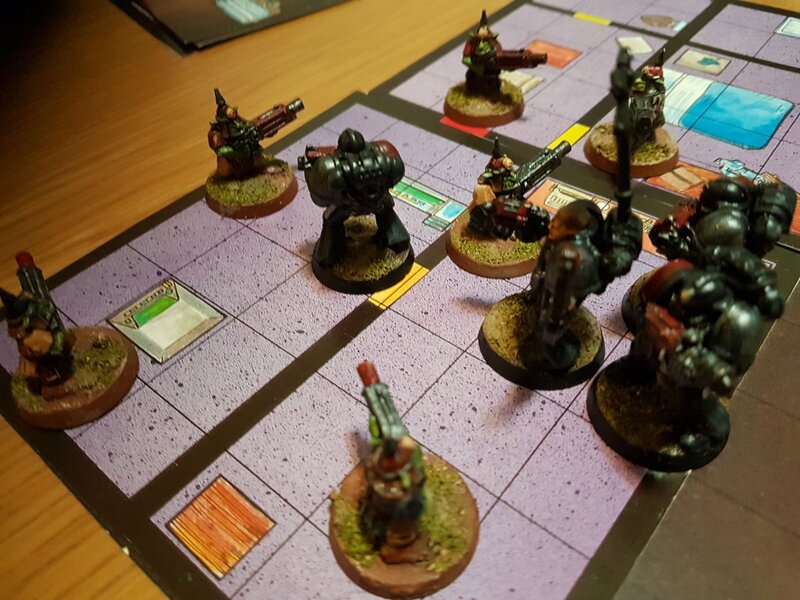 I don’t mind admitting a strong influence on our Black Ops skirmish game (still WIP for now). Every trooper has rolls a certain number of dice depending on what action he has chosen, modified by what he’s armed with, with a basic rule of 6 generating an offensive action (such as shooting someone in the face), and 1 generating a defensive action (dodging out of the way). The designers commented that they hoped to produce a system that was easy to play but hard to read, and you know what, they managed it. 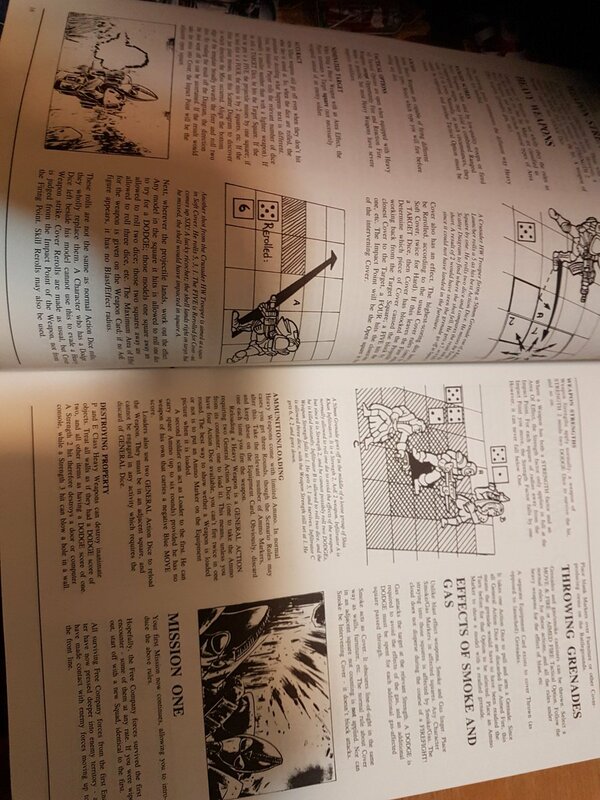 The rulebook teaches you the rules stage by stage, starting with a basic house clearance mission where a Levy squad with a Crusader NCO clears a house of Shia Khan Goblins and Infiltrators, and the subsequent missions bring in heavy weapons, melee, more sophisticated actions such as medical aid, and mini campaigns on both strategic and tactical levels, where your Crusader or Levy platoon patrol across a city working their way through snipers, ambushes and (as the name suggests) firefights! 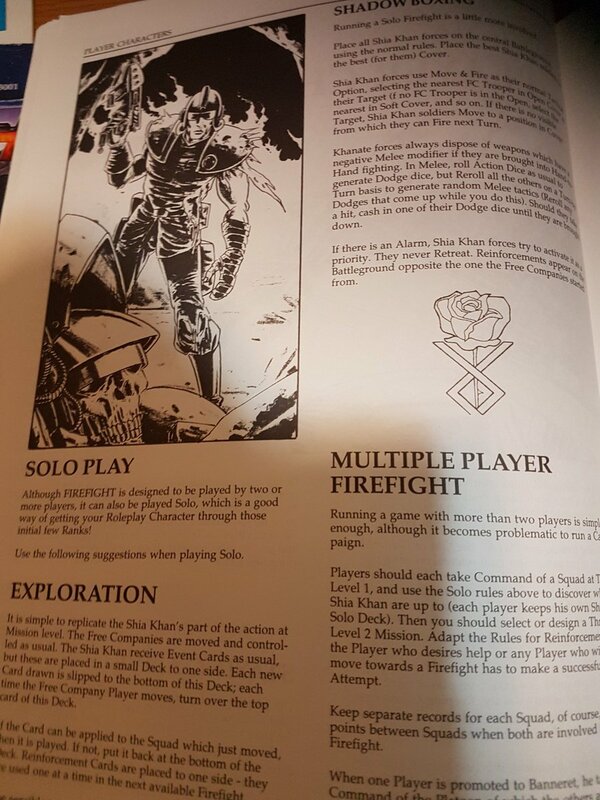 A very Rogue Trader aesthetic in the rulebook.. Pretty certain the same artist as a LOT of the early 90s GW stuff! This game is up close and personal! It’s been a real blast getting back into this game again, and I’m planning to replace the thin card tiles with proper MDF based jobs with 3D terrain to enhance the feel – yet another project! But for the meantime, when we want a quick skirmish with minimal set up, low model count etc, this is our go to game for the moment, and I think will be for some time. 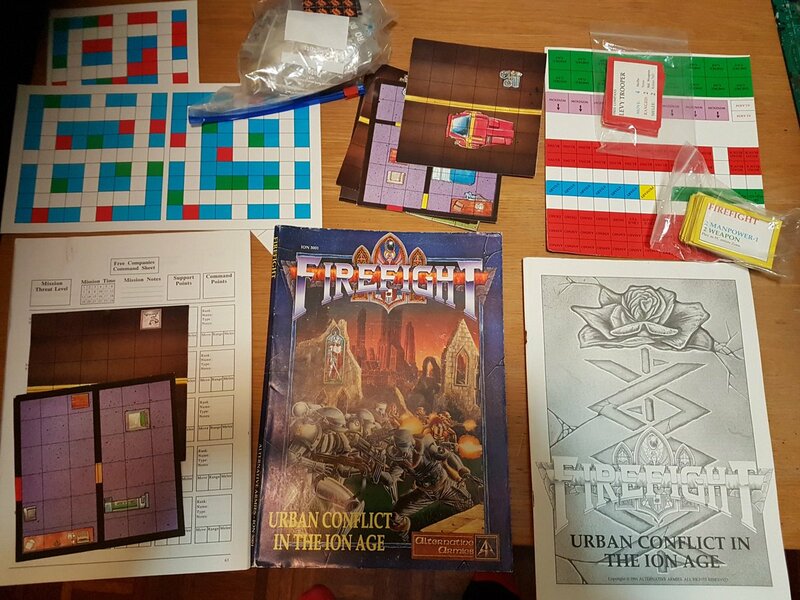 I thoroughly recommend this game for anyone looking for a quick fix wargame, and I commend the Alternative Armies team for producing a classic that holds it’s own 27 years later! You can still find copies on eBay if you hunt around, this game is worth the effort to find. Till next time, stay thrifty out there! Thanks for the info on the game. It is one I remember seeing back in the distant past but never looked at at all. Love this. I picked up two copies on eBay a while back. One to cut up and one as a spare! I have even gone so far as to buy all the models needed for the scenarios presented in the book (still available from AA). 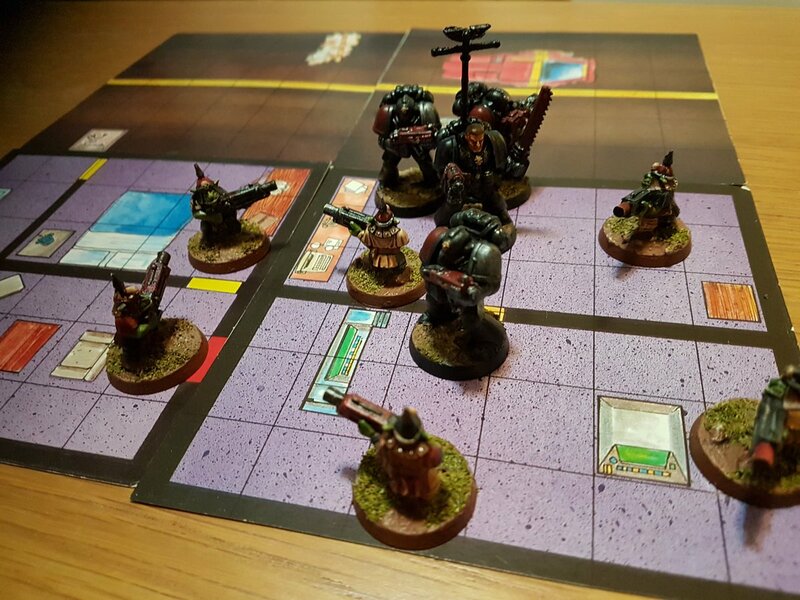 Unfortunately I have never got round to painting them or actually playing… Which is a shame as I think it is a really interesting set of rules, especially when combined with the campaign and solo rules. I can’t bring myself to sell the minis again, so will no doubt give it a proper go at some point. Thanks to this post, I’m now able to identify a bunch of random minis that I got in an Ebay lot as the command unit from the Prydian Army! Does sound good, so thanks for he review! Will keep me eyes out for that! A couple years ago, one of those big wargames resellers must have interested a shipping pallet full of these, because they were on sale for $5 USD, still sealed in the shrink wrap! I picked up two copies, reasoning that I’d give the other to my opponent if I ever convinced anyone to play it with me. Glad to see it’s getting some love on your game table too!